Regarded by many theatre professionals as the greatest musical ever created, GYPSY is the ultimate tale of an ambitious stage mother fighting for her daughters' success while secretly yearning for her own. Set in the 1920's, when vaudeville was dying and burlesque was born, GYPSY explores the world of show business with brass, humor and heart featuring the hits "Everything's Coming up Roses" and "Let Me Entertain You." "...All of the singing voices in this Gypsy are strong and clear, though none more than the amazing MaryKate Brouillet in the title role. Her sweet sincerity elevates the heart-on-its-sleeve sentiment of "Little Lamb" and later adds fire to the show-stopping sisterly duet of "If Momma Was Married."" "...Ultimately, Toby's Dinner Theatre's production of "Gypsy" was a faithful adaptation of a classic show, and even if you don't consider yourself the type of person who enjoys Golden Age musicals, I encourage you to give this one a chance - there's a reason it has resonated with audiences for the past six decades." "...Everything's coming up Toby's! Everything's coming up- TOBY'S! 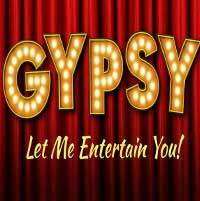 Let them entertain you with their stunning, thrilling, exciting, and magical production of Gypsy. Directed by Mark Minnick and Toby Orenstein with Musical Direction by Ross Scott Rawlings, the truth of a brilliant story is told in earnest, with the heart of that gripping tale at the forefront of the show creating honest theatrical magic for everyone who comes to the table and lets the cast and crew of Gypsy entertain them. A cherished classic with beloved musical numbers and a captivating narrative, Toby's Gypsy is the perfect heartwarming winter's tale to beat out those blustery mid-season blues." "...Gypsy, which premiered in 1959 and became a film in 1962, is based on the memoir of Gypsy Rose Lee who, for a time, was America's number one stripper, having imbued the shedding of clothes with smarts and class. She really did have a little sister named June Havoc, who became an actress, and an overbearing stage mom-ager named Rose who may have killed another woman. The drama. No wonder this became a musical-a delicious one, at that, often described as America's greatest. Thanks in large part to the complex Rose."